Mediterranean cuisine with a mixture of Italian, Greek and French. ​​Marion's is newly renovated and has a very warm, quaint feel. Bring your date for a romantic dinner or gather with friends and family for a casual night out. Grab a spot at the bar after work and enjoy an appetizer and drink. Kid's menu available. Reservations and walk-ins welcome. Executive Chef Marion Smith brings a fresh new concept to the table at The Holiday Inn. 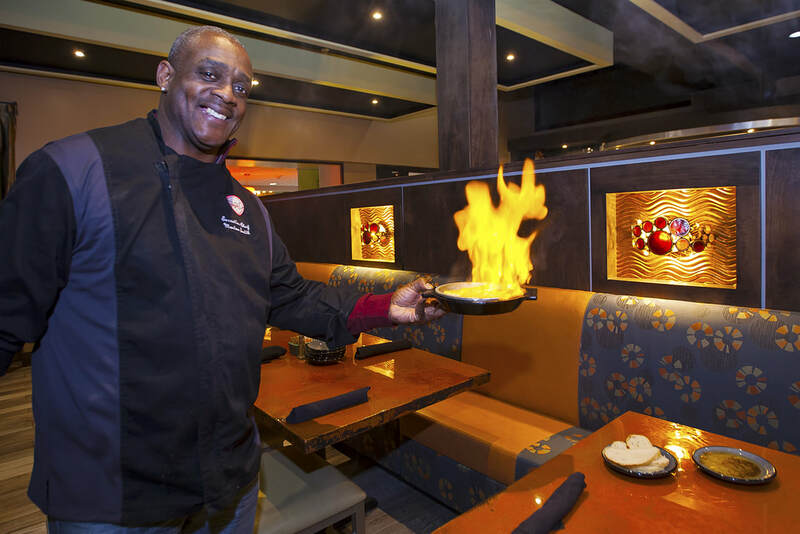 A native of Cleveland, Ohio, Marion Smith enrolled at The Culinary Institute of America in Hyde Park New York and embraced his new career with passion. Upon graduation he worked at Geracis, James Tavern, and The Cheese Cellar. He then went on to secure a position at Classics inside the Omni International Hotel in Downtown Cleveland as the Executive Chef. Marion has been on the Board of the March of Dimes “Healthy Babies”, Member of the ACF Cleveland Chapter, Instructor at Lorreta Pagini School of Cooking and Zona Spray Cooking School. Chef Marion has also won many awards for his cuisine. When asked about himself, Chef Marion is a bit reticent. But he finally admits that he does have specialties; he really likes preparing international food dishes and leans toward Italian, Chinese and French Cuisine. He feels like the classical dishes always come back, that diners will try new trendy, even faddish foods, but after time they will return to the classics.